Join me on my final stop on the Survive Or Die blog tour at Pulp and Mystery Shelf. I reveal how I became a published author, why I write cozy and amateur sleuth mystery, and three tips for people wanting to become authors. Read here. On Kings River Life today, you can read my Earth Day themed article on the benefits of abandoned mines. While the detritus of 19th century mining might sound incompatible with environmental stewardship, bear with me. Sometimes attempting to fix one ecological issue exacerbates another. Read here. Also on Kings River Life is a fabulous review of Survive Or Die, my novel touching on the issue of abandoned mines. Read here. My guest today is L. C. Hayden, author of the Harry Bronson thriller series. 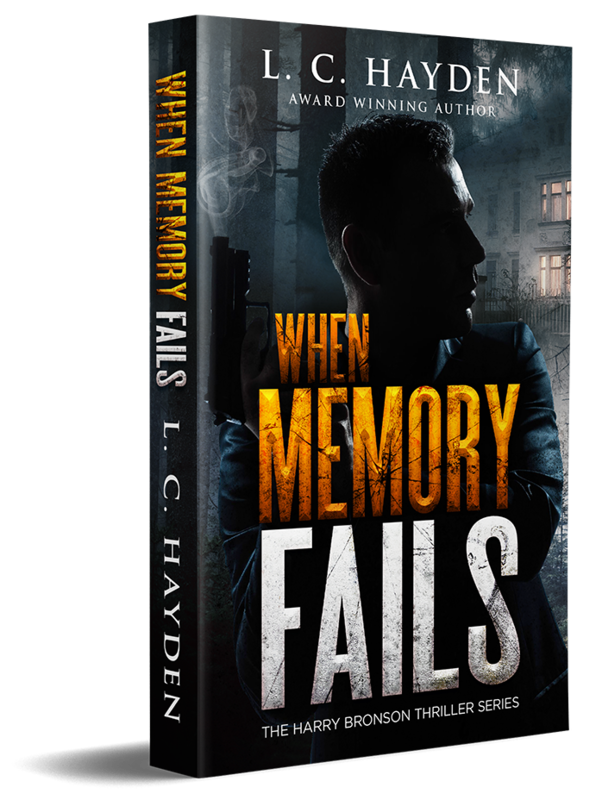 Her newest novel, When Memory Fails, includes a memorable character, Honey the dog. L. C. tells us how Honey charmed her way into a thriller. In order to understand how Honey, the dog, came to be a character in my latest thriller When Memory Fails, one must first know a bit about the story’s basic plot. Sandy Sechrest, her boyfriend Daniel, and retired Detective Harry Bronson head for Sechrest Falls, a ghost town in Colorado, which houses an alluring ledger that the three seek. The sole resident in this ghost town is a character simply known as The Hermit. In order for this story to work, I knew that the Hermit needed to be a strong character, one that the readers would identify with. However, when I read the first draft of When Memory Fails, the Hermit was definitely not memorable. The story needed something that would give the Hermit a boost. I considered adding another character. I quickly eliminated that idea as it would only detract from the story. What then? I thought and thought. Then it hit me. The Hermit would have a dog. Yes, the right type of dog would be ideal. Once I had decided this, my next step was to create such a dog. That meant first finding the right kind of breed. I felt overwhelmed when I realized that a lot of types of breeds exist, not to mention the sub-breeds. Which one should I choose? And how could I narrow this list down? As I’m brooding over this, my dog, a Basenji named Honey, nudged me. She nudged me again. Feed me. “Later,” I told her. I wanted to finish my research. She gently hit my hand with her nose. No, now. I glared at her. She nudged me again. I sighed and stood up. “Okay, dog, you win.” I went to the kitchen and prepared her food. For any other dog, this would be the end of the task. But not for Honey. She insists on me being present when she eats. If I simply put her food down and walk away, she will follow me and not eat. She’d rather starve. Consequently, I crossed my arms and waited until she finished eating. Once she did, I quickly headed for my computer to finish my work. Honey ran in front of me, blocking my way. I stopped and looked at her. Aren’t you forgetting something? her eyes seemed to ask. I gave myself a mental tap on my forehead. Oh, yeah. Her after-dinner treat: a dental chew stick we call Greenie. Thank God she is willing to eat this by herself without me being present. I gave it to her and made a mad dash for my computer. Minutes later, she stood by me and yelped. Basenji’s don’t bark as their ancestors used to live with the Egyptian pharaohs in their castles. Therefore, the dogs were not allowed to bark. To guarantee that there would be no barking in the castle, the kings ordered that the dogs’ vocal chords removed. Through generations, this breed of dogs lost their ability to bark, but they are definitely not one-hundred percent quiet. They learned to yodel and make all kinds of other noises. Thus the reason Honey yelped instead of barked. I knew what she wanted. “Let me finish this first, and then we’ll take you for your walk,” I told her. She let out another high pitch yelp. I did my darnest to ignore her. Rich, my husband, put her harness on and the three of us went for the walk. Half-an-hour later, as we headed home, I treasured the idea that Honey likes to take a nap after her walk. Good. Finally, I’ll find the time to continue editing my novel. We reached our house, and Rich said that he was a bit tired and was also going to take a nap. Great! A picture of a quiet house danced in my head. I could finally focus on the revisions. That lasted a whole five minutes. Honey let out a loud whining, not once, but a constant sound that sent a chill running down my back. I bolted out of my chair, nearly knocking it down, and ran down the hallway and into our bedroom. Thankfully, being hard of hearing, my husband remained sound asleep. Honey stood beside the bed by his head, looking up at him, whining. “Honey, what’s wrong? You’re going to wake Daddy up. Hush.” I pulled her toward me. She worked her way free and resumed her stance by Rich’s head. Once again, she whined. I grabbed her again and the entire incident repeated itself. Rich sat up on the bed. Her answer came in the form of another whine. “Okay, okay. We’ll play.” Rich got up and reached for his shoes. Soon as he was out of bed, the dog jumped up and occupied the same spot Rich had just vacated. She curled up and went to sleep. I shook my head. “What a dog,” I told my husband. I went back to work on my computer. Now, let’s see, where was I? Oh yeah, I was about to decide on what kind of a breed the dog in my story should be. I considered the qualifications I needed for my fictional dog to have. First of all, the dog shouldn’t be too big or too small. It had to be just the right size. An image of Honey popped in my head. I nodded. Yeah, a dog about her size would be ideal. Second, I needed basically a quiet dog, like a Basenji. Same image popped up. Honey. I needed a dog that had a cute personality. I needed a dog that had a strong personality that always found a way to communicate with the humans in the story. I shook off the images and began the research. I typed in on the Google bar dog breeds. I heard Honey gently snoring, happy that everything had gone according to her schedule. I closed the search bar. I didn’t need to do any research. I had everything I needed here at home. And that’s how Honey became a character in my book—and will continue to be a character in future Bronson books. When Memory Fails is available here. ​You can learn more about author L. C. Hayden and her writing here. I answer interview questions today on the Mysteristas blog. Learn more about what made me interested in writing Survive Or Die, and my idea of a perfect day, which includes one of my favorite hobbies. Read here. The Secrets of the Castleton Manor Library - on audio! I just learned The Secrets of the Castleton Manor Library series is available on audio book. I wrote two novels for this 24 book super cozy mystery series. Mine are #14 titled Ink or Swim, and #23, A Thorny Plot. If you like your mysteries sweet, and you enjoy audio books, this is just the thing for you. Sign up here. I encourage you to focus for the month of April on writing! Camp NaNoWriMo lets you set your own limits. Dust off that manuscript, or if it doesn't need dusting, kick it into high gear. I'm here for you if you need encouragement or a swift kick in the keister. I can use encouragement likewise. I'm trying to finish a rough draft of the next Rock Shop Mystery. I am frustrated that I seem to get dragged away from my writing all too often. The November NaNo hits at an impossibly busy time of year. There's no time like the present! I've got my knapsack and my walking stick. Off I go! Survive Or Die appears on Karen’s Killer Book Bench, while I answer author questions such as, "Pick two celebrities to be your parents - who would they be, and why?" You can read my interview here. I'm back on the virtual road this week with another blog tour stop. Today Survive Or Die is featured on Bab's Book Bistro, where I talk about how life can be stranger than fiction. You can read my article here. Survive Or Die appears on Buried Under Books today. I discuss how three story ideas – a company team building exercise, a survivalist training camp, and a visit to a museum exhibit about a Colorado cannibal – slowly twined together into a novel.